My grandmother, each Christmas, would make cream cheese spritz cookies. I loved getting them, a big coffee can full of cookies, with no wrapping except a holiday bow on the plastic lid. It was “something to open” alongside the checks she gave me and her other three grandchildren. Her spritz were formed from a cookie press into little circles, often not very neatly, because she made hundreds of them that time of year – and other times too – and gave them to everybody. I have her recipe for cream cheese spritz and the cookie sheets she baked them on, but oddly, I don’t have the cookie press she used to shape them. It’s a shame because I cannot seem to form even her lopsided squiggle shapes very well with the press I do have, and so making these cookies became a source of frustration for me. Her cookies weren’t fancy, but they tasted like Christmas. In recent years, I hosted a holiday cookie exchange. I think I started it when The Child was about 6, and all my friends seemed to like it, so I did one every year, until last year, when The Dog’s deteriorating health made the whole thing just too stressful. One friend was quite disappointed, and left a plate of cookies on my door, saying, I look forward to next year – but this year rolled around, and I still didn’t feel like it. The Child was disappointed. I didn’t mind missing one year, she said, but two? Will we ever do it again? I tell her the women’s group I belong to is hosting an exchange, and so we’ll bring cookies and let someone else host, but she’s not satisfied with this. The women are boring, she says. I point out that it’s a lot of the same women who came to our house every year, but that’s not the answer she’s looking for. What she wants, we discover after some discussion, is not a party at all: She wants my eggnog cookies. She wants some to eat, she wants some to give to her teachers and friends. I don’t mind. I already have all the ingredients. The recipe is originally from The Complete Cookie , by Barry Bluestein and Kevin Morrissey, which rather sadly seems to be out of print, though you can still get used copies on Amazon for not too much. I think I received the book as a gift the year it came out, or possibly bought it as a gift for myself when I was doing some holiday gift shopping (one for them, one for me …). Whatever the case, I loved it enough that although many cookbooks have come and gone from my shelves since then, it has stayed. The Eggnog Cookies weren’t actually my favorite recipe from the book, but became my holiday cookie-party staple for one simple reason: unlike many holiday cookie recipes, they’re crazy easy. They’re just drop cookies, and require no refrigeration time, no rolling and cutting, no cookie press. There is no elaborate icing. There are no special, expensive, or obscure ingredients to buy. Basically, if you get just one bottle of rum extract, you can whip up last-minute holiday cookies for several years. And yet for all this lack of fuss, these cookies still say Happy Holidays the way only eggnog can. I made a batch one evening, supposedly for the ladies’ cookie exchange, and The Child came down and helped herself to several. They didn’t have their powdered sugar topping yet, but she didn’t mind: They were soft and warm from the oven. She swiped a few on the way out to school the next day, too, still untopped but still perfect, she says: We’re giving them to everybody. Preheat the over to 350 degrees F. Lightly grease two cookie sheets. Whisk flour, baking soda, salt, and nutmeg together in a bowl, and set aside. Using a stand mixer with the paddle attachment, beat the eggs and sugar until smooth and thick. Add the softened butter, rum extract, and cream. Mix at a low speed until thoroughly blended, then increase speed to high. Add the flour mixture and beat until incorporated. Drop by rounded tablespoons onto the cookie sheets, leaving 2 inches between cookies. They will spread. Bake for 10-15 minutes, until lightly golden, delightfully fragrant, and firm to the touch. 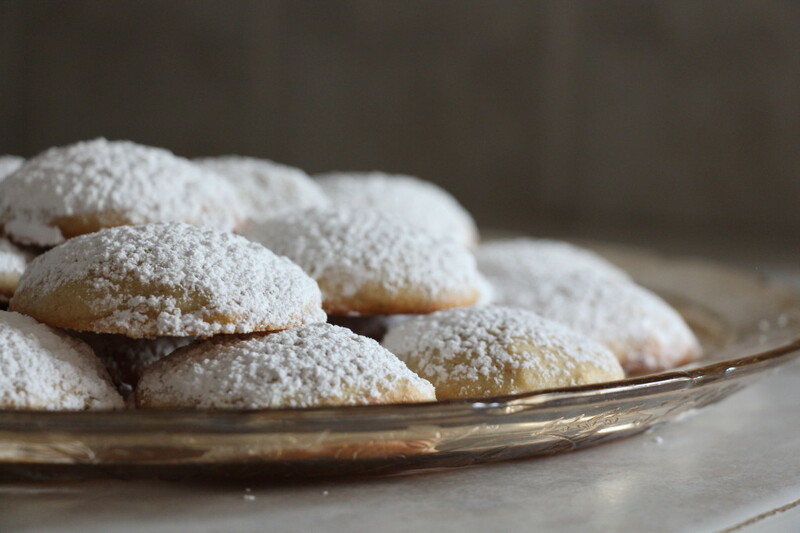 Remove to cooling racks and dust with powdered sugar and a pinch of extra nutmeg, if desired. The original recipe calls for only 6 tablespoons of butter, so you may wish to reduce the amount you use. I tossed in a full stick by mistake but found that worked well. I love eggnog so these would be good to make. They look yummy. Glad to find your blog. Thank you for directing me here and for my fabulous gifts. You rock!